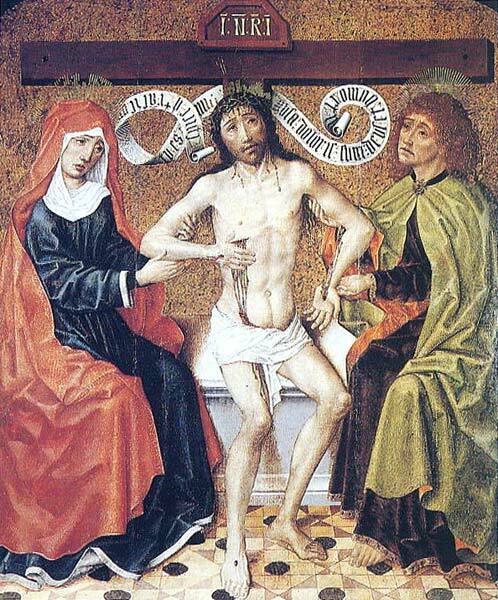 This lovely medieval image depicts Our Lady Saint Mary, Saint John the Beloved Disciple, and the Wounded Side of Christ. Together, Our Lady and Saint John teach us the contemplation of the Sacred Heart and of the Holy Face. The stational church is none other than Saint Peter's Basilica: the faithful of Rome assemble at the tomb of Saint Peter. The purple veils that hide our sacred images recall the great veil that in ancient times was stretched across the whole sanctuary, obliging the faithful to go by faith and longing into the inner sanctuary, the invisible one where Christ is victim, altar and priest.